As of September 2010, AWHS juniors and seniors whose GPAs and citizenship meet muster will be able to enroll in a selected number of courses for collegiate as well as high school credit. These courses will be sponsored and approved by Syracuse University, Regis College, UMass Boston, Emmanuel College, Stonehill College, Assumption College, Quincy College and University of Connecticut. This opportunity reflects the collegiate level of rigor and expectations that already exist in our school and should make us all very proud! Next year's offerings will be but a preview of coming attractions. Our hope and plan is that more and more of our courses will carry the option of collegiate credit. Those students taking courses for college credit will do so on our campus during the regular schoolday. Still, their experience will be at the college level. The course outlines syllabi and textbooks assigned to these courses will be defined and approved by each respective college sponsor. The teachers of these college credit courses will be members of our faculty and approved adjunct instructors as recognized by the college sponsoring each teacher's course/s. College grading in a particular course will be given in addition to each student's high school grade in that course, and as a seperate grade. Receive a collegiate grade in addition to the high school grade. Apply to and register for the college course, and pay the fraction of collegiate tuition that students seeking college credit will. Be required to visit the college campus once or twice per year. Have access to the college library, databases, resources and more; as will students taking the course for college credit. The college credits earned at AWHS will replace credits and courses taken at the sponsoring school, should a student attend that school as a freshmen. These credits will also replace courses and credits at any college accepting the sponsoring school's credit in transfer. AWHS students who take and pass a Dual Enrollment course will never wonder again whether or not they can succeed in college; because they will have already done so. Information concerning specific courses offered for Dual Enrollment will be forthcoming. 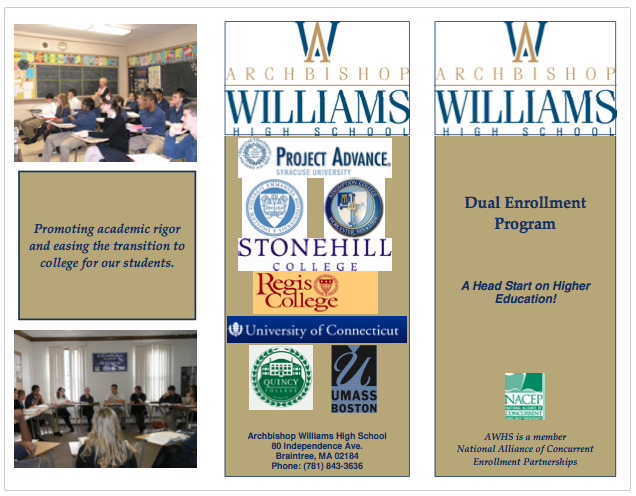 Click here to download the Dual Enrollment brochure.